ADHD stands for Attention Deficit Hyperactivity Disorder.ADHD may be one of the most “common neurodevelopmental disorders” diagnosed in children, but it can last until adulthood. Some people may have the disorder for a couple of years and others have always had it. While symptoms of the disorder can affect professional, personal, and social aspects of daily life, it can be easily managed, especially if symptoms are mild. In this article we will discus details about signs of adhd and it’s treatment. ADHD treatment, therapy, and medication and other methods can help ease the characteristics of the disorder. Before learn about signs of ADHD you have to know different types of ADHD. There are three different sub-types of ADHD, depending on which traits of the disorder are more apparent. The first is predominantly inattentive presentation. When this type of ADHD is present, it usually means that the individual is impaired to the point where they cannot focus or listen. They are also unable to follow directions or have conversations. Typically, they also get distracted, frequently lose or misplace items, and forget daily routines. Predominantly hyperactive-impulsive presentation displays itself by constant movement (like fidgeting), being unable to sit still, or difficulty in performing quiet tasks (like reading or studying). Additionally, disruptive behavior like, interrupting, intruding, constant talking, and extreme impatience are also characteristics of this sub-type of ADHD. People with predominantly hyperactive-impulsive symptoms are also more likely to be involved in accidents and suffer from related injuries. Combined presentation is when symptoms of both inattentive and hyperactive-impulsive presentation are evident. Firstly, Signs Of ADHD may start during childhood. History of the disorder as a child can be a predictor of adult ADHD development, because it is often carried from early life into adulthood. Some reasons why adults may think that they do not have ADHD is because the disorder can change sub-types over the course of a lifetime. As a child you may have hyperactive-impulsive symptoms, but as an adult you may develop more inattentive presentation traits, and vice versa. But regardless of the subtype, they all exist under the ADHD umbrella. Certain research studies show that ADHD does run in families. According to the US National Library of Medicine, “Family studies show that the biological relatives…with ADHD display higher rates of ADHD than relatives of controls…the familial risk of ADHD is higher than for rheumatoid arthritis but lower than for schizophrenia. Disorders can cluster in families because of shared environment as well as genes.” Every day more cases and studies are being reported which show the strong family link. More than one ADHD diagnosis can exist within families. There are more studies that show the inclination towards inheriting the disorder, not only within immediate families, but within extended families (example: cousins, aunts, uncles) as well. Additionally, multiple studies also show that there is a strong genetic link among twins. For identical twins, the likelihood of the disorder showing up in the other twin is as high as seventy percent. For fraternal twins, the possibility of ADHD in the other is as high as forty percent. Identical twins share more genes, so the likelihood is higher in them than in non-identical twins. We all have sluggish days due to a lack of sleep or other physical components, which zap our attention spans. However, signs of ADHD in adult is when your attention span is severely impaired to the point where you cannot pay attention in short interactions or conversations. The frequent loss of focus, loss of items, lack of concentration, or the inability to remember basic tasks are all signs of the inattentive sub-type of adult ADHD. One of the trademarks of ADHD is rapid fire thought and excessive speech. These signs of ADHD exist under the hyperactive-impulsive sub-type of ADHD. This symptom may cause problems within a person’s professional and personal relationships. Uncontrollable speech is especially problematic in work situations because it represents a lack of impulse control. Blurting things out, interrupting, repetition, and unsteadiness are negative qualities that can jeopardize reputations, relationships, and other facets of work life. Forgetfulness and absentmindedness both fall under the inattentive sub-type of ADHD. The Diagnostic and Statistical Manual (DSM) says that a person who, “is often forgetful in daily activities,” may be someone with the inattentive subtype of ADHD. Forgetfulness can dangerously impact adult life, especially if there are young children in the home or if their job is a position where they are responsible for care and safety of others (examples: nurse, teacher, or police officer). While fidgeting may help children with ADHD concentrate, it does not have the same effect on adults. Additionally, adults’ work and social environments and the behaviors expected in those environments, can make fidgeting problematic. 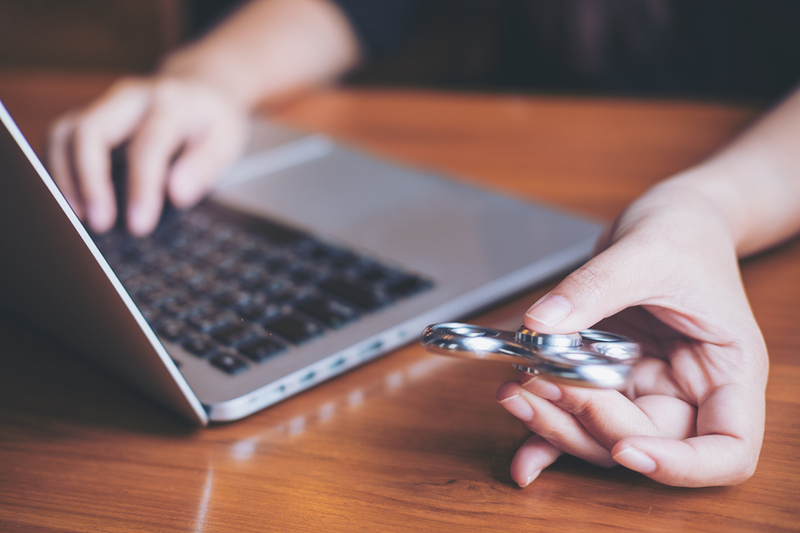 Frequent fidgeting is a sign of ADHD in adults, due to its hyperactivity element. A physical activity routine or participation in a sport may help ease the levels of this symptom. Recklessness is a sign of adult ADHD. Impulsivity and a lack of mental and emotional regulation contribute to recklessness. It can be dangerous in adult lives. This symptom can affect everything from driving to childcare to marriages. The spontaneous and uncontrollable aspect of this symptom is troubling for decision-making and personal, professional, and social living. Consistent therapy can help understand the connection between thinking and feeling. Therapy can also teach impulse control and help the patient identify indications of when reckless behavior is about to occur. The symptoms of ADHD lie on a spectrum. The symptoms mentioned here might have mild effects, which only minimally impairs lives. On the other end, sufferers from ADHD can have severe symptoms. This may result in the inability to pass classes or hold a job, due to problems focusing or the inability to appropriately participate. While ADHD is not curable, it is more than manageable. Medication, like Adderall, is sometimes prescribed to help ease ADHD symptoms. While medication may balance neurotransmitters, there are also side effects. Medication is prescribed at the discretion of a physician. Considering wellness activities like eco-therapy, yoga, or meditation can significantly improve mood, hyperactivity, concentration, and impulse control. However, frequent therapy with a practitioner who specializes in ADHD, may be the most beneficial move. Therapists equip you with effective strategies and tools to work with behavioral issues. With the help of a trusted mental health professional, life with ADHD can be manageable, full, and positive.